Who said that traveling had to be done the same usual way? During their trip in Germany, Sport Management students offered a different perspective on the matter. Very common in academic papers, finding a gap in the literature and building from the latter can lead to new perspectives and approaches in a particular field, with an aim of benefiting a larger group of the population later on. Through the travelling experience lived by the Sport Management master students of Molde University College during their trip to Germany, some students have decided to explore unbeaten pathways in order to, as other scholars would, propose a valuable alternative to the established agenda of travelling. This alternative approach to travelling consists mostly of walking, therefore not really offering the most innovative perspective, but more so being a proposition of slowing down and returning to basics. In our dominated by technology western world, where Google Maps and other smartphone features rule the directions of our paths, some people might resent a lack of autonomy and authenticity when visiting new places. Far behind can seem the times of one’s youth during which spontaneous and creative behaviours would lead to the most unexpected adventures. Nevertheless, during their time in Germany, some of the Sport Management students decided to adopt an unorthodox way of discovering the country with the black, red and gold flag. Forget the easiest routes, the taxis and ubers, forget the tourist hotspots and let’s explore new pathways. Starting from Molde, alternative options are not very wide. The first step to reach other regions of the world consists of making a connection to Oslo, Norway’s main hub towards foreign destinations. And without a train station or direct buses to make it to the capital, Molde Airport appears as the necessary first stop to anyone’s journey abroad. Once in Oslo, options are much more important to reach your final destination. The latter in this context was Mainz, located in the Rheinland-Pfalz Land, south-west in Germany, with the nearby Frankfurt airport being the closest flying possibility. Most decided to logically choose this option, but others went on a different path. From a group of Norwegian students arriving early to attend a Bundesliga football match between Hannover and Leverkusen, a German student going to Hamburg first to spend some time with his family before the academic trip or other students flying to Berlin in order to take a bus towards Frankfurt, everyone could choose their preferable route. It is in this regard that the few days off between the last lecture at the university and the beginning of the programme in Germany on March 13th offered the possibility for students to either take the time to prepare the trip until the last day or add a few stages to the latter. Once in Frankfurt, the choice is simple. Like most people, one can take the S-Bahn towards Mainz Hauptbahnhof and reach the final destination within an hour. Other options consist of making the trip from Frankfurt to Mainz by simply walking or cycling along the Main river. Despite naturally being more time and effort consuming, these alternatives can only offer a first glimpse of unforgettable memories during your journey. Through the roughly eight hours required to arrive in Mainz if going for the walking option, a good pair of shoes and either an audio book or your favourite music playlist can turn out to be useful. But not having any of the latter can also enhance the discovery of the local landscape. The experience is worth giving it a try when time allows for it. Following the R3 route that links Frankfurt and Mainz, a path built to suit cyclists’ safety needs far away from cars and trucks, it really is an immersion into the regional heritage which is at stake. Discovering the small towns of Eddersheim, Flörsheim am Main and Hochheim am Main is rarely planned on most travelling agendas. However, including these little towns on your journey would allow you to see the local football stadium bordering the river, the equestrian facility and its horses getting ready for the day in the early morning or people’s hospitality when asking them to fill up your bottle of water or use their toilets. In between these small towns, the journey along the Main river highlights the beauty and the singularity of the landscape. It is therefore difficult to avoid the numerous vineyards that expand through several kilometres and which produce the famous red and white local wines of the region. There are also several times during which it is possible to witness the train passing through as it connects passengers from the different corners of the Rheinland-Pfalz, leading most people to their working place and helping tourists in their sightseeing adventure. This uncommon path can also be a place for unexpected encounters. 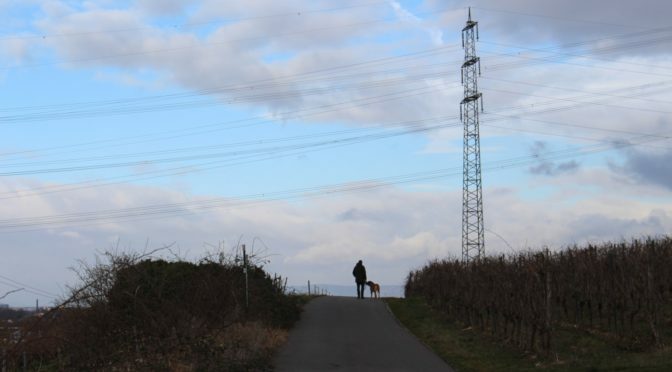 When looking around to get the best view of the passing train between the river and the vineyards, do not forget to keep an eye on the route in order to avoid potentially walking over a dog with no leash and very little interest in noticing you. After such a journey, the arrival in Mainz does not signal the end of the road. On the contrary, after a necessary shower and a good night of sleep, the next day is a new source of opportunity for discoveries. And if in our case most of the day was dedicated to the academic program at the Johannes Gutenberg university, the free evening that followed could not be wasted. While some students therefore decided to go into a local pizzeria and try out some enormous pies, others decided to go for an exploration of the city of Mainz during the evening. With no map and no particular destination in mind, the setting was ideal to experience some of the local culture. And after asking for directions and recommendations regarding the best places to go, the students entered into a relatively crowded bar with the objective of getting some useful insights about the region. Once inside, starting a conversation with the locals is not the most difficult task to achieve when you appear interested about their city. A woman at the bar therefore explained that the month of April was a good period to discover Mainz due to the Stijl Markt being held at this time, which offers a mix of artistic products such as clothes and decorations. Another man who was watching on his phone the Europa League football game of the evening between Eintracht Frankfurt and Inter Milan, shared in the meantime some fascinating insights about his favourite football team, SC Freiburg. He went on to talk about the unique philosophy of the club, which surprisingly puts its sporting performance after its social impact, and by doing so highlighted the passionate relationship that Germans have with the Beautiful Game. Also part of this year’s Sport Management trip in Germany, a couple of days in Berlin accompanied by the students of the Johannes Gutenberg University of Mainz looked like another opportunity to create some memorable traveling experiences. With this in mind, most students from the German and Norwegian universities decided to spend their first evening in Berlin with a proper introduction to the night life in the German capital. A great way of socializing between the two groups and a counter-example to the stereotypes often used to describe Germans as overly serious and Norwegians as introverts. Despite probably being worth the cost, such a night also goes along with a required next morning of oversleeping. Thankfully, the next day’s program did not start before the afternoon and hence offered a few hours of sleep to the ones coming back in the early morning. On top of that, the program of the day was provided by a guide in the historical part of Berlin, therefore allowing the most tired to exert the least effort possible. But if most students effectively decided to make the most of their limited time in Berlin during the previous night, others had different plans for the morning and decided to go for an early walk of several hours in order to enjoy the morning sun in the city before the afternoon rain. Departing from the hotel located in West Berlin, they headed towards the city centre and the meeting point of the afternoon near the remains of the Berlin Wall. During this approximate journey of ten kilometres, squirrels, donut breaks and Hertha Berlin fans fueled their experience and created some unique memories that most likely would not have been the same if they had decided to use the bus or the city subway. Joined by the rest of the students at the meeting point, they felt perfectly warmed up as some of the other students were still feeling the effects of the previous night. But regardless of the route chosen to travel in Germany, everyone seemed satisfied to have participated in this trip and glad to have created some memories adapted to their own traveling style, although some might have a harder time remembering everything. We can argue that this is the proper way of traveling, adjusting your journey according to your own needs and expectations. Nobody should follow the usual path because it precisely is the usual path. Even if it requires slowing down and taking the time to reflect on alternative options or creating your own, traveling is like several other things, there is rarely a ‘one size fits all’ type of route. More so, it is most likely that regardless of the path we undertake, one will eventually reach its final destination. To sum up this journey as academic papers would, it is important to discuss our findings. During the 2019 Sport Management trip in Germany that lasted between one and two weeks, depending on one’s decision to arrive early or leave a few days later, all the students had the possibility to design their own path in order to make the most out of this opportunity. From meeting new people, discovering new places and experiencing a different culture, each one managed to create their own story. And it is in this regard that this so-called conceptual framework should be criticised by the next generations of students. Very likely, the trip in Germany will be proposed to students in 2020 and for the following years. It will therefore be their responsibility to make spontaneous decisions regarding the path that they will decide to create for themselves. No route is already carved in stone and anyone can adapt his or her direction for the better.